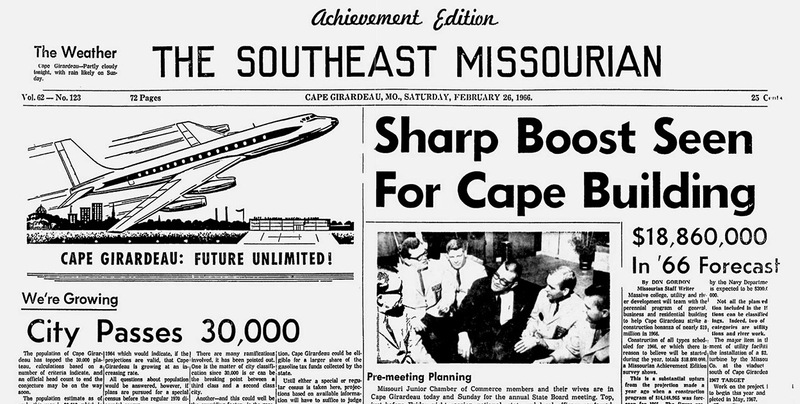 The Achievement edition – known internally as the Atomic Edition – was a yearly wrap-up of what SE Missouri had done in the past year and what was coming down the pike. (Literally, in this case, because they were talking about getting I-55 done between Fruitland and Portageville). The paper was all excited because the population was estimated to have passed the 30,000 plateau, 1,349 more than the estimate a year ago. 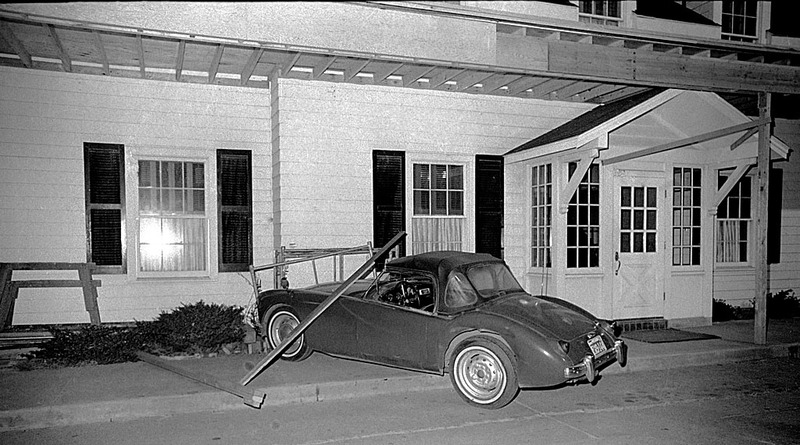 That estimate, in turn, was 1,144 greater than the one in 1964. State College students accounted for 671 of the 1,349 increase. That was kind of a big deal, because 30,000 was the tipping point between being a third class city and a second class city in Missouri. The larger population also meant a larger proportion of the gasoline tax rebate would be flowing to Cape. 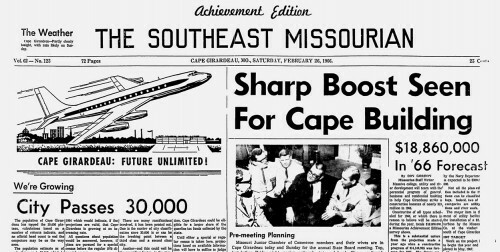 Cape was disappointed in 1960 when the city fell 53 people short of having 25,000 people, even though The Missourian offered a silver dollar to each person coming into the office to fill out an affidavit that they had not been counted in the census. The official tally turned out to be 24,947. You can’t say we didn’t have interesting stories in The Missourian. Floyd McGregor, owner of McGregor’s Market, 1004 North Sprigg, accidentally shot himself in the head with a 22-caliber rifle. The bullet entered under Mr. McGregor’s right eye and passed through his head near his right temple. “He apparently thought the bullet had just grazed his cheek, I don’t think he was aware the bullet actually entered his head,” Sgt. Donald Roberts said. He was in the hospital in satisfactory condition. The story said that Mr. McGregor had borrowed the rifle to shoot a cat. He was unloading the rifle when it accidentally discharged. The fate of the cat wasn’t reported. A more amazing story is that of Clarence D. Snider, who died at the age of 72, leaving an estate of $465,581.67 in stocks. What makes it amazing is that Mr. Snider worked for 50 years as a heeler at the International Shoe Company; he was paid about $80 a week at the time of his retirement in 1959. His coworkers said he would generally show up for work about an hour early and spend the time poring over newspaper stock reports. He and his wife, Ella, lived in a house he built in 1915 at 123 South Boulevard. It was valued at $7,500. Southwestern Bell was rolling out mobile telephone service in the Cape area. The only catch was that it only worked for a radius of about 25-30 miles and only one frequency was available for all users in the coverage area. If one person was using the service, everybody else would get a busy signal. When I was bored, I’d monitor the frequency, which was around 152 MHz, just below Cape PD. Most of the conversations were people who wanted to impress their friends and clients with the fact they were calling from their cars. I was amused to hear a local radio station “newsman” recording a whole bunch of “actualities” from his car phone. “This is Joe Jones reporting from his mobile telephone in Cape Girardeau.” Followed immediately by “This is Joe Jones reporting live from his mobile telephone in Advance, Mo.” Followed by “This is Joe Jones bringing you news by mobile telephone from Perryville.” Rinse and repeat. The ad said it was “greatly enlarged and newly remodeled.” That might be why it looked like the building was being worked on in my wreck photo. P.S. I never did find the story I was looking for. 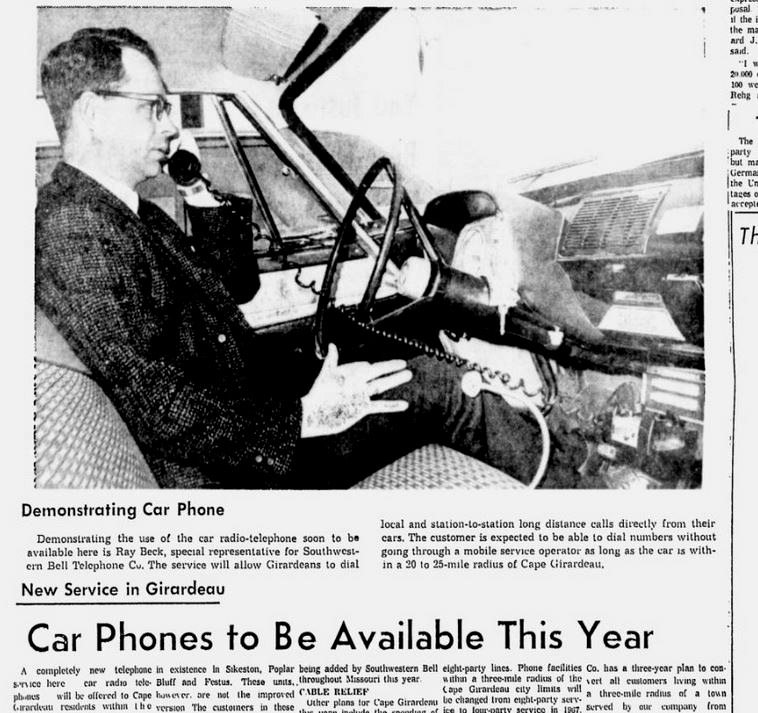 Ah the car phone, my dad had one. It looks simple in this photo, but the business end was in the trunk and took up almost half of it. And I carry so much more in the palm of my hand today.